The desert seems to beckon lost souls longing for renewal. Perhaps it’s the utter starkness of the landscape, free from visual clutter and distraction, that quiets the soul. Or, maybe it’s the calming effect of a profound silence that only empty space can produce. Here, in the desert, the human mind is forced to confront itself, to be still and to listen from within. Here, where mere survival is an art form, all that is frivolous quickly melts away. Joshua Tree National Park is best known for its boulders and sheer rock faces that provide excellent rock-climbing opportunities, particularly in winter when mild temperatures attract climbers retreating from the snowy Sierras. With over 50 miles of maintained hiking and horseback riding trails leading through three different desert ecosystems, the park is also a mecca for serious hikers, backpackers and trail riders. Although the park sees 1.25 million visitors a year, it is one of the most rustic of all national parks. Within park borders, there are no hotels, cabins, gas stations, restaurants, museums, souvenir shops or convenience stores. The only development consists of simple campgrounds, roads both paved and unpaved, and maintained hiking trails. Within its 800,000 acres, it is easy to isolate oneself in Joshua Tree. Feeling a need to cast off worldly demons, I journeyed to Joshua Tree for a solo desert sojourn. I chose to see the park by foot via day hikes. 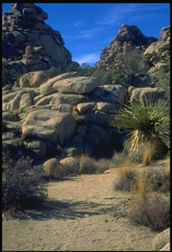 Having only two days, I concentrated on the northwest section of the park, entering via Twentynine Palms off Calif. 62. On day one of my two-day visit, I ventured along the Lost Horse Mine trail, an easy 4-mile (roundtrip) trail leading into the heart of the Mojave Desert. Stark but far from lifeless, Joshua trees, Mojave yucca and creosote bush abound. Looming ominously above, blue and purple snow-capped peaks are an ironic backdrop to the dry desert floor. It struck me that the Joshua trees, which dominate the landscape, do not huddle in groves, but stand independently, each staking its small claim to the desert’s sparse life-giving nutrients. I was amazed at how human-like the trees appear. But, perhaps that is only vanity, for I know few people that can stand as still as the Joshua tree, roots planted securely in one place. Even its sinewy leaves remain unmoved by the wind. Its roots reach deep into the arid earth as its languid limbs stretch for the sun, embracing that which it should fear most. It seeks not to ascertain, but waits patiently, composed and stolid, for the next blessing from Father Sky, the rain. I wish that I was a Joshua tree. The trail ends at Lost Horse Mine, a relic of California’s historic prospecting days. Feeling a million miles away from nowhere, it was strange seeing something man-made out here. But, a century ago the toughest of men and women braved the desert in search of that yellow metal for which so many in history have died. After the gold rush came the legendary cattle ranchers and settlers lusting for free land, and the cattle rustlers lusting for free cattle, who attempted to carve life from the parched earth. This is the place where one can easily imagine dusty, broken-down wagons and cow carcasses strewn about while vultures ominously circle above in the cloudless sky. The miners and ranchers and settlers are all gone now, the desert won that battle, and so life goes on as before: slowly, patiently, quietly. For day two, I hiked the trail to Ryan Mountain, a moderately strenuous walk up to a 5,461-foot summit. The trail commences beside a amorphous group of gigantic boulders, that seem out of place in the flat valley, like they were tossed out there haphazardly atop one another. Like the other thousands of boulders throughout the park, they give an archaic feeling to the landscape, as if Fred and Wilma Flintstone may come trotting around the corner. Climbing up the rocky trail, I passed more Joshua trees and Mojave yucca, their trunks blackened apparently by fire. But starkly contrasting bright green leaves proved that the struggle for life continues. At the summit, I found a comfortable sitting rock and gazed out upon the vast, empty desert valley and the forbidding mountains beyond. The first thing I noticed as I sat was the overwhelming silence, broken only by an infrequent hawk cry. I challenged myself to be still, to clear my head of all thought and just listen to the silence, a silence so pure that it acquired a mysterious musical quality. As I meditated upon the aphonics, I thought about how negative space gives form to a sculpture, and how the silence between notes gives structure to music; and, therefore, it stands to reason that stillness gives power to life. From the top of Ryan Mountain, the gigantic boulders appeared to be tiny denizens of the flat desert floor, not so out of place as I has thought before. Up here, I too felt tiny. It was comforting to feel insignificant, like a huge weight of responsibility was lifted from my shoulders. I felt not like and occupant of the park or California or even America, but an inhabitant of planet Earth, one more soul in a vast universe, a universe that I could neither manipulate nor ignore, but just participate in its process. I don’t know how long I sat contemplating these things, for time seems to stand still in the desert. But, slowly, the sun began to sink and I made my way back down in the cool shadow of the mountain. As I drove out of the desert that afternoon headed back to town/work/the 20th century, I was forced to stop abruptly by a furry blur darting across the road. I stopped short, and so did the coyote, staring at me with his yellow eyes from across the road. We must have locked eyes for a full minute, neither one of us moving a muscle. He finally scuttled off into the brush as another tourist’s car slammed on its brakes behind me. Then I too proceeded, slowly, patiently, quietly.